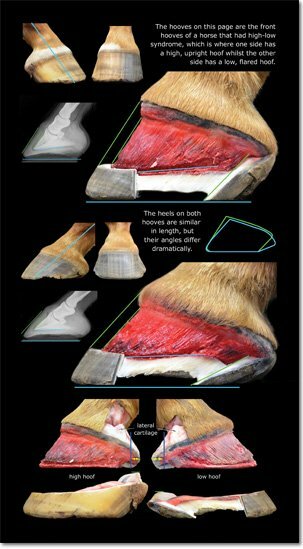 We are all familiar with hoof distortions such as cracks, flares, long toes and bulging hairlines but how do we tell if they are just a minor blemish or whether they are in fact hiding much more serious issues? 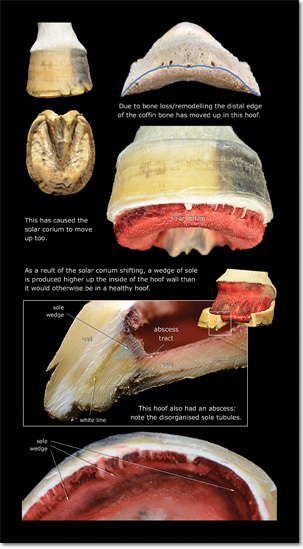 Horse hooves are dynamic structures which allows them to distort and change according to outside pressures and the environment. 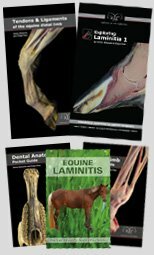 This helps prevent imbalances from being translated to the boney column of the horse. 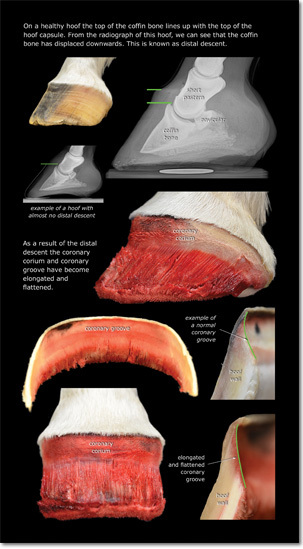 Slight changes here and there are fairly common, but hoof distortions are often cumulative and once they start adding up, the hoof then becomes much more susceptible to collapse. 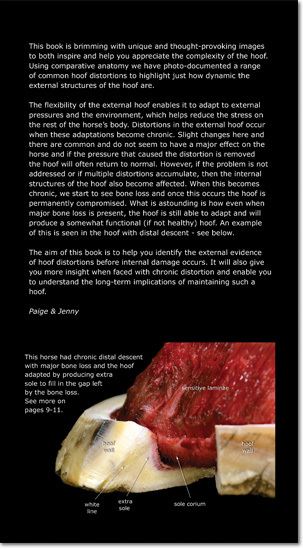 This book takes a look inside many common distortions to provide valuable insight to the health of the underlying structures. 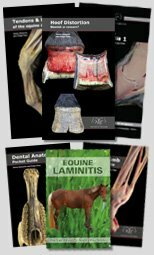 Each time you look at the images in this book, you will discover more detail. It is brimming with so much information there is no way you can comprehend it all with one reading. Own it! Digest it! Use it! If a picture is worth a thousand words….how about hundreds of pictures? 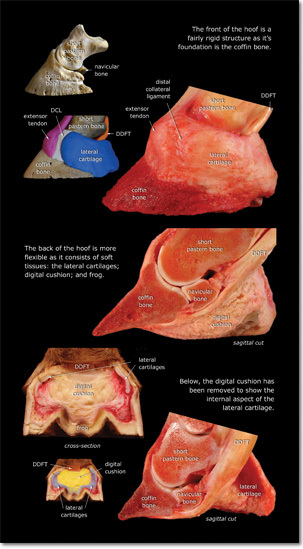 Next we learn about where the hoof capsule originates from and take an in-depth look at the coronary corium and coronary groove. 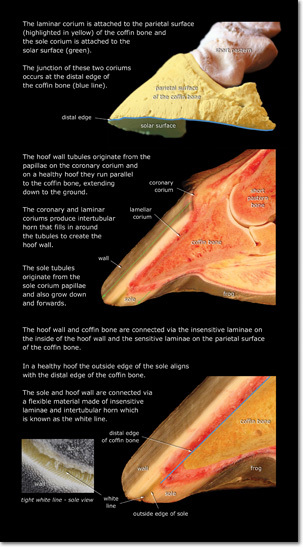 This is where we introduce some of the changes that are seen within the hoof capsule. 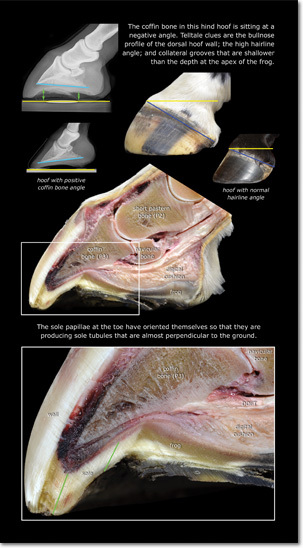 The hoof is flexible so that it can adapt to its environment and minimize stress to the horse. Hairline distortions are very common but what causes them? 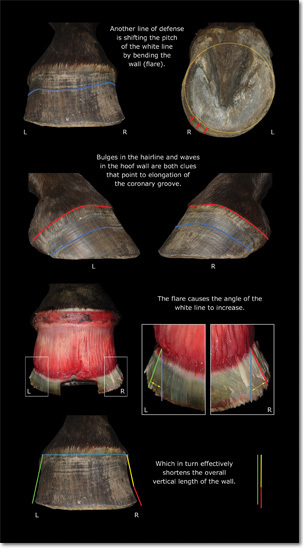 This spread shows three different cases and delves into the mechanics of this type of distortion. 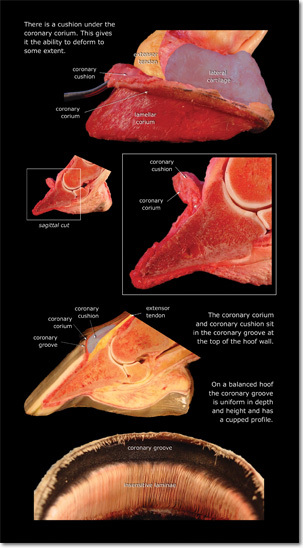 What are the sole and coronary band telling you? 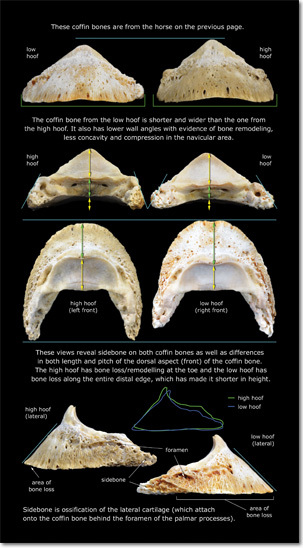 Here is a unique way to compare sole distribution and coffin bone shape in 3 distinctly different hooves. 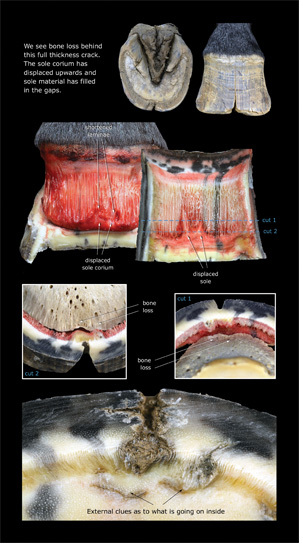 These photos begin to reveal the extensive damage that is caused when there is distal descent of the coffin bone. 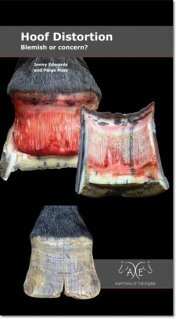 It is shocking how often distal descent is seen in x-rays, yet rarely is anyone as alarmed as we are. 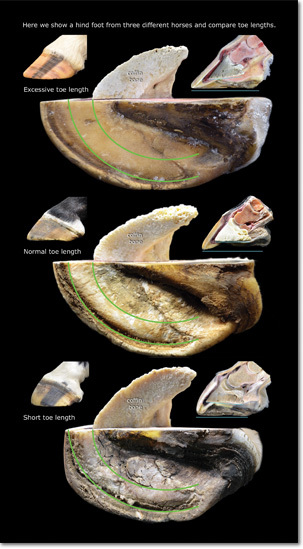 Distal descent is most definitely not a mere blemish. 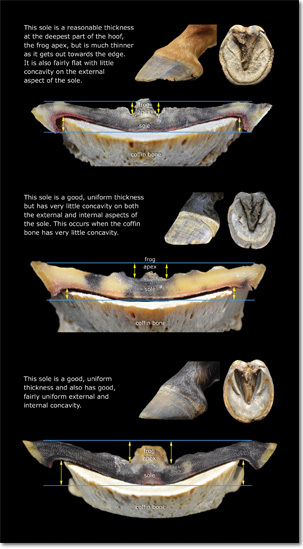 This makes it vitally important to identify it early so as to prevent extensive damage. Most owners are concerned by the dubbed toe like the hoof on the right, but not many think twice about a tidy little foot like the one on the left, however that long toe is hiding a multitude of issues. 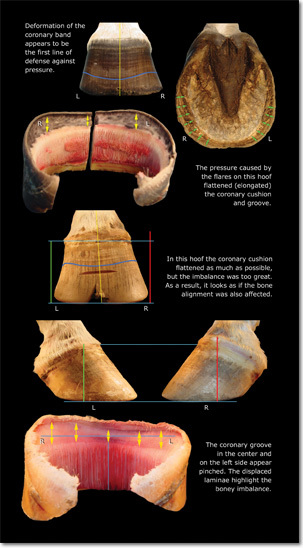 Image by image we help you 'see' how hoof shape interacts with the internal structures. High - Low, can they ever match? 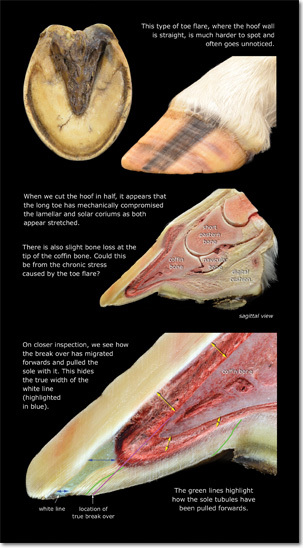 Here we compare the high foot with the low foot on the same horse. 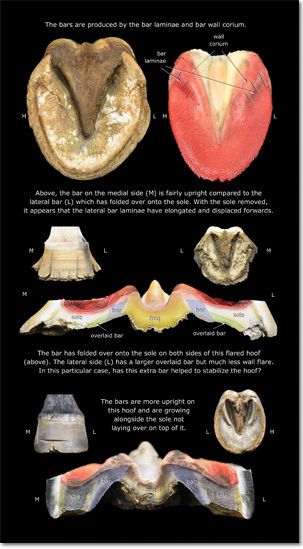 These dissections reveal so much startling information about this all too common issue. A blemish that drives owners crazy! 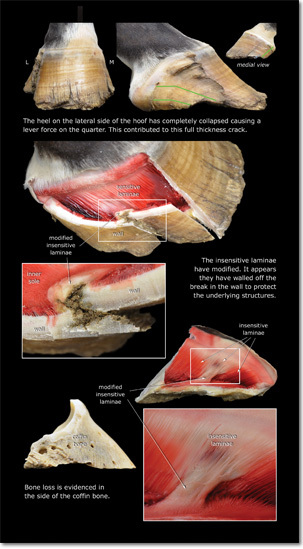 Luckily horses are rarely lame from surface cracks. 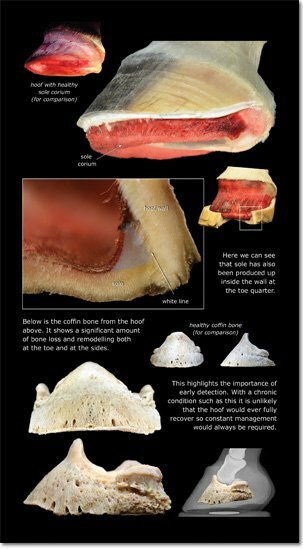 But when you see the extent of the internal damage beneath these seemingly minor cracks, it is mind-blowing that this is the case. 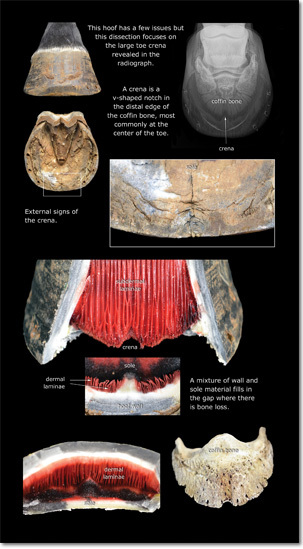 Then there are the deep cracks and crenas. 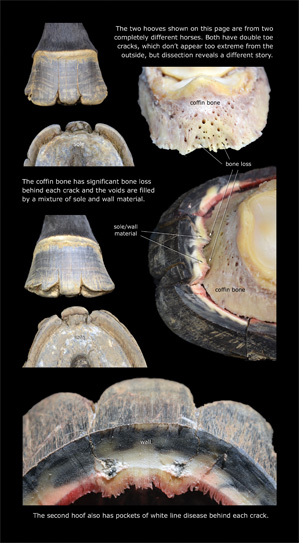 Both of which involve bone loss. What fills the void and how does that affect the horse? 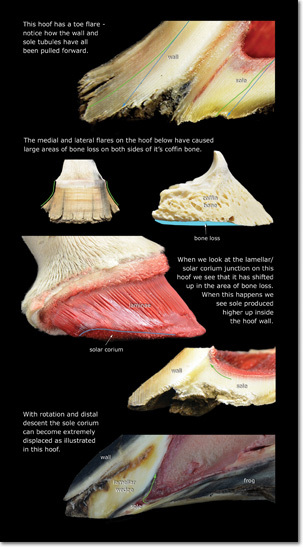 Things that affect the hoof that we often don't even think about. That is what this book reveals....those things.